The design that should have been. We made our design with the basic items shown below along with an 1877 understanding of electricity and magnetism. We improved the return path for the magnetic field and involved the diaphragm in this path. The essential items were an electromagnet, a soft iron diaphragm, and a fixture to hold them. This design worked. We believe that if Bell had been more familiar with the electromagnetic principals that he would have gone with this design on his first try. He got to it after the patent was in his hands. The disk responds to the variation of sound pressure and moves back and forth in the magnetic field of the electromagnet generating a current and voltage in the coil representing the sound variations. 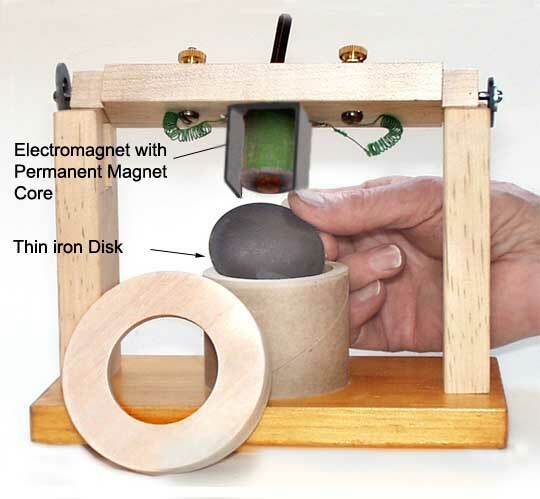 We added a fixed magnet to the end of the electromagnet core to produce a resident magnetic field which is picked up by the disk. this makes the disk act as armature of a generator. One could have wound the coil around a permanent magnetic as shown in the Oct 6th 1877 Scientific American. The diaphragm is used to generate the undulating current and voltage in the coil as a transmitter. When transmitted via wires to a similar unit it would produce sound from the vibrating soft iron disk and thus act as a receiver.